The Dash for Doobie has developed into a self-sustaining top performance engine that continues to delight and entertain fans of track and cross country around the southeastern US, and to affect national 3200 rankings. Even in its "off" years (which do happen occasionally, due to weather or the absence of a few key athletes), the meet serves up great competition and PR's galore. On the boys' side, a mind-boggling 87 athletes broke 10 minutes, absolutely destroying the previous meet record of 63 in 2015. That includes 22 under 9:30, more than double the number from 2015 and well ahead of the meet record of 18 set in 2013. For the girls, Jenna Hutchins and Carmen Alder posted the #3 and #4 times in meet history, respectively - and in theory, both of them will be back to battle twice more, as Alder is a sophomore and Hutchins a freshman. They were joined in the meet's all-time top 10 by Katherine Priu (#6) and Natalie Tyner (#7). Out of the 19 total sections of the 3200, 11 were decided in close finishes on the final straight. 50 girls and 56 boys met the 4A indoor track standard for state meet qualification. It's no wonder this meet pulls top talent from multiple states, and has become one of the signature events of both the cross country and the indoor track season! 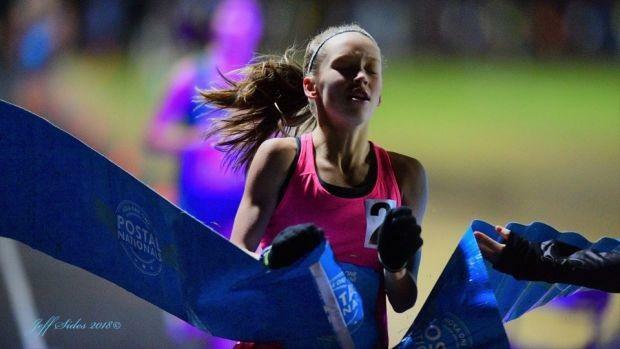 Read on for individual highlights from the incredible slate of races.